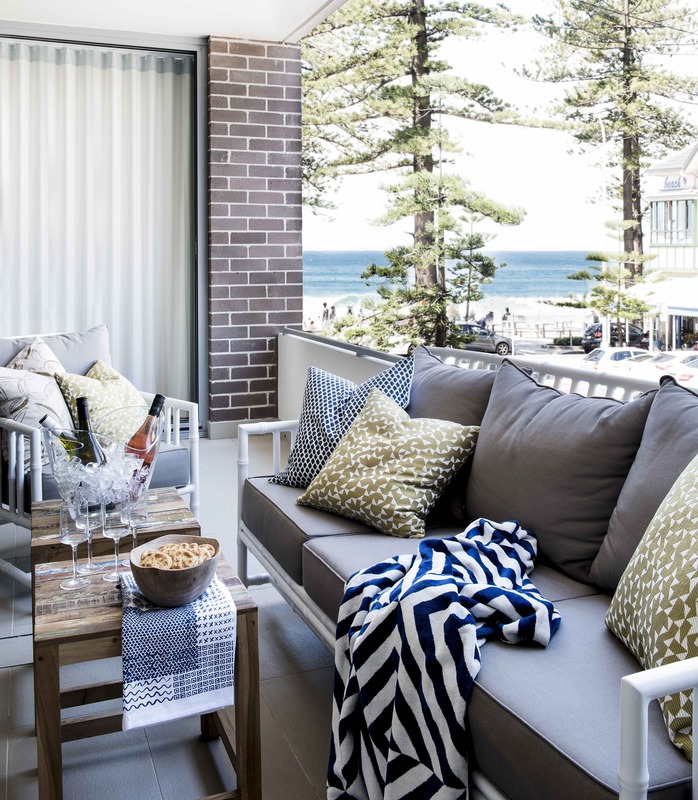 Located just off the boardwalk on Manly Beach NSW, this Beach Pad is a holiday getaway for a young family with five children. 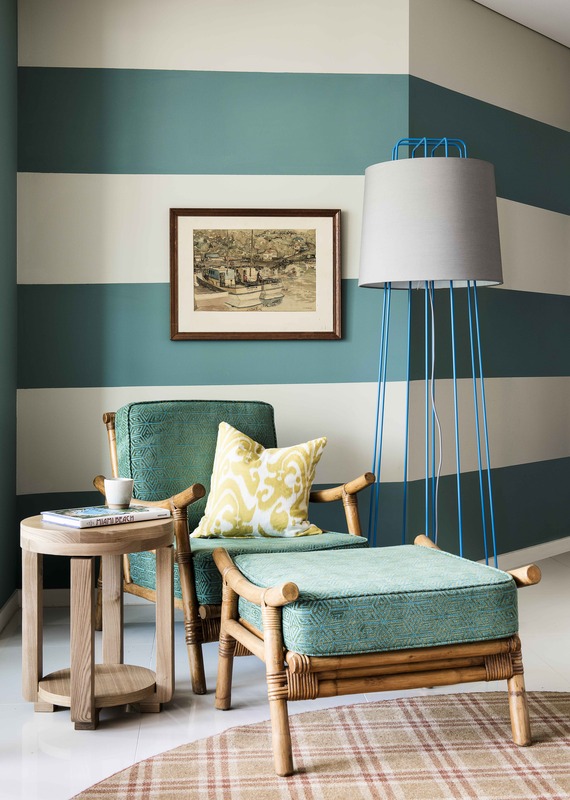 The clients requested a space that felt relaxed and playful, while also being inspiring; a space with a retro beach vibe, that says “come in relax and throw your shoes off”. Within the space we needed to allow the family to dine, rest and play. The spaces where relatively tight for this many people, so all space planning and designer tricks had to be employed. There was little the building would allow in structural changes, so we predominately transformed the architecture with colour. In the dining room, a built in banquette and oval table allowed for a large dining area with a small footprint. 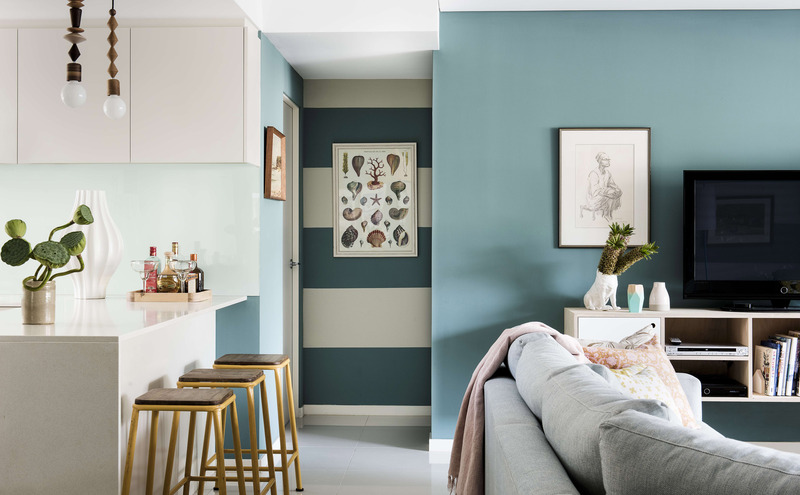 The banquette upholstery is in vinyl for practicality and coloured to blend with the wall so it virtually disappears. 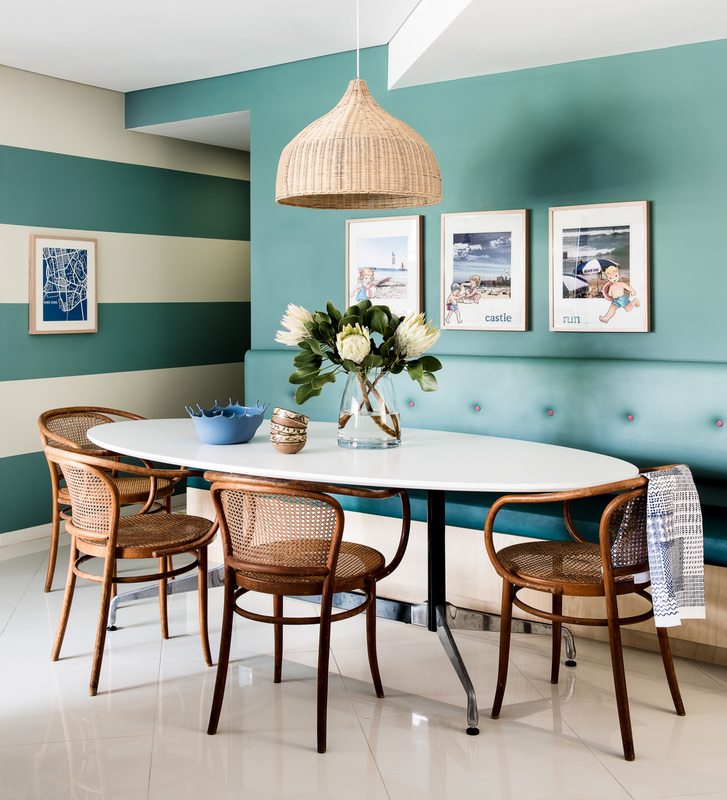 Using four vintage Bentwood chairs along with the banquette seat, adds interest and creates far less visual noise than a table surrounded completely by chairs. The entire area is grounded by the large handwoven African basket pendant light. The adjoining living area includes a large sofa with a 120 deg angle that allows for a lot of seating and the ability to face the view. A plaid oval rug elongates the space while a wall hung TV console, 2 vintage Bamboo chairs in a chenille and side tables made of recycled timber, complete the room. A combination of colour and pattern where chosen in the fabrics to add depth and personality to the space without matching; this helps create the relaxed feeling and an impression that these items may have been gathered by the family over some period of time, giving the home a story and sense of history. Bold colours focus attention on the views, furniture and art. 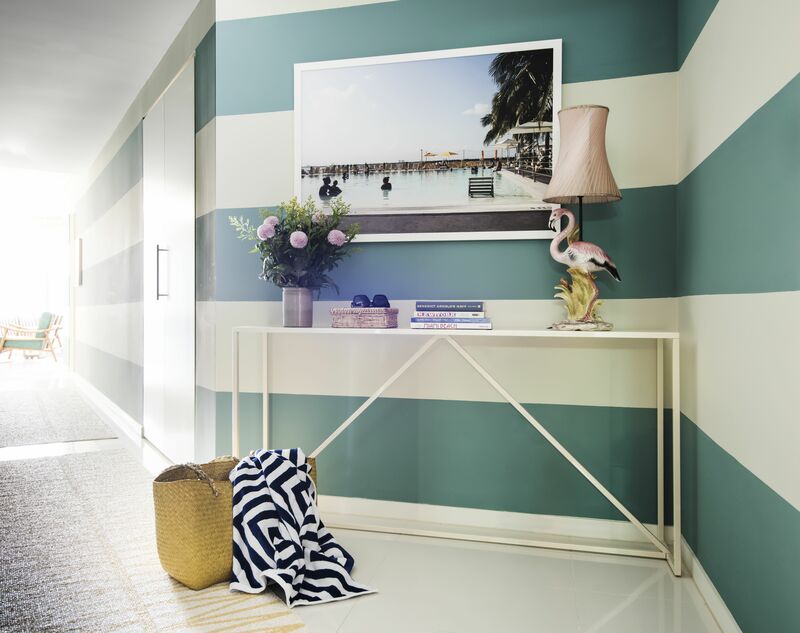 Striped walls lead into the home and add visual depth in the hallway. The children’s bedrooms were painted in a strong sky blue for the older children and a soft pistachio for the toddlers. 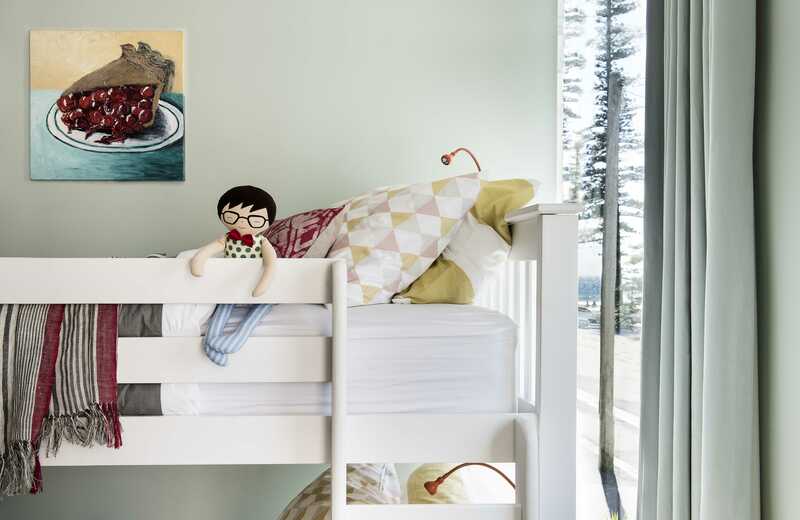 In the master bedroom, walls the colour of wet sand create the base for a calming scheme. Vintage Parker side tables flank a simple upholstered bed from Bludot. 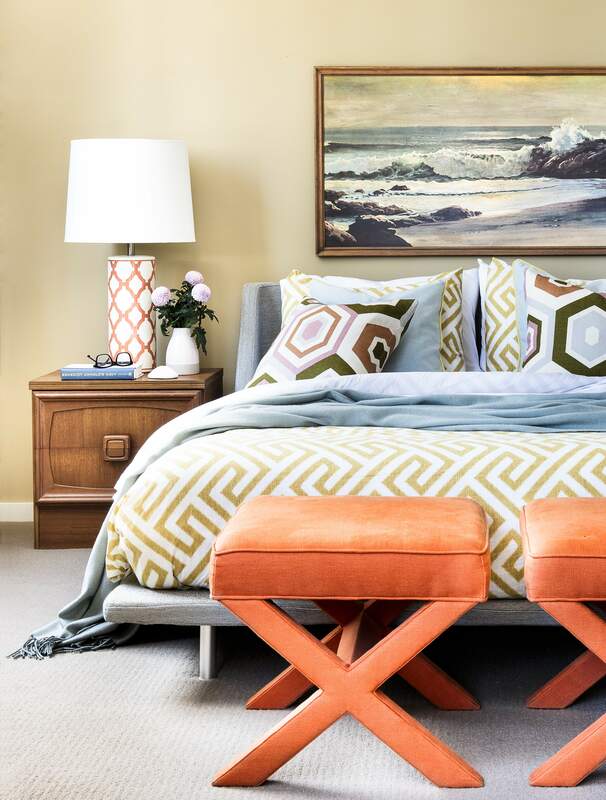 The bold pattern and colour, retro orange upholstered foot stools from Johnathan Adler and a vintage ocean painting, set the scene for a relaxed beach house vibe. 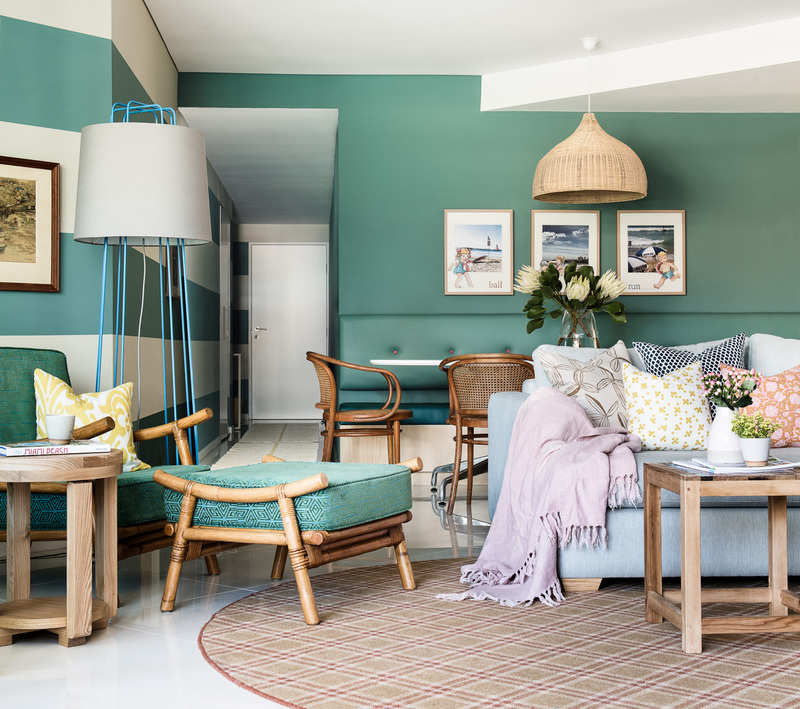 This beautifully colourful home with its subtle beach and vintage vibe combine to create a contemporary family getaway. The only trouble now is trying to persuade the family its time to leave.